Place eggplant and garlic on a baking tray with olive oil and roast for 20-30 minutes or until eggplant is soft. Allow to cool. 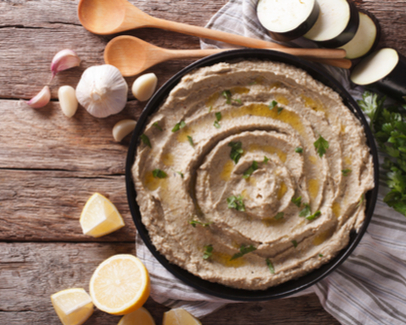 Place eggplant, garlic, tahini and lemon juice in a food processor and process until smooth. If you don’t have a food processor you can just mash the ingredients together in a bowl.